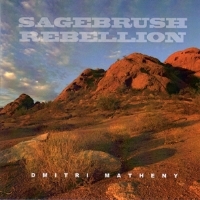 Description: Sagebrush Rebellion, Dmitri Matheny's tenth album as a leader, showcases new originals, jazz classics by Johnny Burke and Duke Ellington, and favorite compositions by Charlie Haden, Steve Swallow and Nat Adderley. Celebrated for his warm tone, soaring lyricism and masterful technique, Matheny was first introduced to jazz audiences in the 1990s as the protege of legendary flugelhornist Art Farmer. Matheny has since matured into one of the jazz world's most talented horn players. Recorded live at a San Diego nightclub by Jim Merod, the inimitable recording engineer and producer of BluePort Jazz, this tasteful, loose-limbed but invigorating session provides the listener a pure joy of straight-ahead jazz and the attractively warm, dark sound of the flugelhorn! Recorded live at Dizzy's in San Diego, California, on November 29, 2013.